The Russians hitherto had the offensive, the Allies the defensive, superiority on the Chernaya; at the walls of Sevastopol it was the reverse. In other words, the Russians were strong enough on the Chernaya to hold the field, but the Allies were not, though able to keep their position; while at Sevastopol the Allies, strong enough to carry on the siege, were so nearly equally matched by the garrison, that the operations, though not stopped from without, yet proceeded with hardly any visible effect. The proportions of force seem about to change, and the Allies appear on the point of becoming strong enough to repulse the Russians from the Chernaya. In that case the Russians can act in two ways, after having lost their position above Inkerman. Either they can go round and take up the intrenched camp about the North Fort, or they can with their main body retreat into the interior, where the Allies cannot follow them far. The Allies can hardly, be strong enough before February either to invest the northern camp or follow a retreating army much further than Bakshiserai. They could scarcely fight a second battle against an army intrenched somewhere about Simferopol. In either case, they would have to fall back on the Chernaya, and thus this game of alternate advance and retreat is likely to be played all the winter over, unless, indeed, Sevastopol, on the south side, succumbs to an assault. But as the news, which we receive by the Atlantic, respecting the siege is very meager, we cannot say more on this point than that it is not at all likely. We are, indeed, aware that, according to a dispatch of December 7th, published in the Paris Moniteur, and reprinted in the London papers, the allied armies had all of a sudden got the upper hand, and only two days after the deluge, "almost completed the investment of the town. "[c] This spurious dispatch was evidently concocted with a view to make amends for the baffled 2d of December prophecy. A short time ago we gave a statement of the sum total of the Russian army, together with its disposal[d]. We then showed that of these nearly three-quarters of a million soldiers, up to the present time, hardly one-third had been engaged in active operations, and that the far greater portion of the remaining two-thirds were employed to menace Austria. In spite of the reenforcements sent to the Crimea, matters have not been much altered since then; for Dannenberg's corps, the 4th, which marched to the relief of Sevastopol, was withdrawn from the army of the Danube, where it had been previously reenforced. The only essential change in the position of the great Western Army of Russia, as we may call the corps of some 300,000 men concentrated on the Austrian frontier, is a slight extension of its left wing towards Bessarabia, and the Middle Dniester, in which position it is enabled, in case of need, to receive the remnants of the army of the Danube in case of their retreat from Bessarabia. The great Western Army may, besides, have detached a couple of divisions to the Crimea, and a few reenforcements to the Danube, but in the whole its strength is unimpaired, and the march of the 3d division of the Guards from Revel, and of some more reserves, will have made up for these detachments. The Danubian army, however, may be considered as entirely broken up, and reduced to a mere corps of demonstration, placed in Bessarabia to keep up the appearance of a Russian occupation as long as possible. By Liprandi's and afterwards Dannenberg's departure, that army was deprived of the whole of the 4th corps (10th, 11th and 12th Divisions), deducting from the remaining five divisions, the 7th, 8th, 9th, 14th, and 15th, the troops necessary for the occupation of the coast, and the garrisons of the fortresses from Bender and Ismail, to Kherson and Nikolayev, and, considering the enormous losses of the two Danubian campaigns, these five divisions could not muster for field operations more than 15,000 men. They are placed near the coast, and wherever there is coast, the Russian defensive, so efficient in the heart of the continent, is lame in the extreme. It has to guard numerous fortresses and dépôts against the attacks of the hostile fleet, and thus it is explained, that of the 30,000 or 35,000 men composing these five divisions not one-half is disposable for the field. The dissolution of the army. of the Danube, like most of the great strategical measures taken by Russia (for the blunders generally commence with the execution of them), is a very well-chosen step. Since the Anglo-French have engaged themselves over head and ears in the Crimea, no enemy opposes the Russians on the Danube. Omer Pasha's army, hardly amounting to some 40,000 men after the wear and tear of two campaigns, never made up for, has, by the aid of western diplomacy, been so broken up, as to leave it scarcely sufficient to invest Ismail, much less to detach a corps to cover the siege, or to repel the Russians in the field. 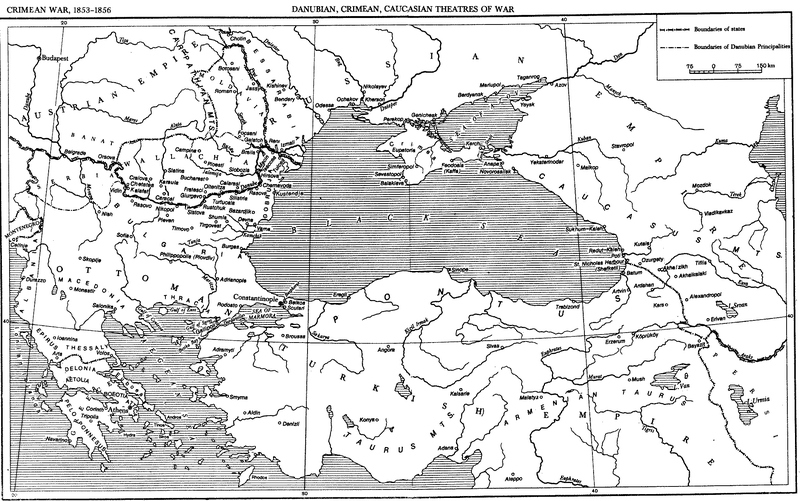 Besides, an attack upon Bessarabia, which would have afforded a powerful diversion some months ago, would now lack a definite military object, and, consequently, Omer Pasha's army is now sent to the Crimea. The only force, then, purporting to menace the Russians on the south-west, is now the Austrian army, which, in a force of some 270,000, occupies Galicia, Transylvania and Moldavia. This force must, above all things, be held in check. For, should it declare itself hostile to Russia, Bessarabia, and even the country up to the Bug, would have to be abandoned, and operations have to be conducted either from the offensive basis of the Polish fortresses, or from the defensive basis of Kiev and the Dnieper. In both cases a Danubian army would be cut off, and have to find a base of its own somewhere in the steppes of the South, which is no easy matter, in a country which feeds many horses and sheep, but very few men. On the other hand, should Austria declare for Russia, or turn the points of her neutral bayonets towards the Alps and the Rhine, then the Polish army might either march into Germany as a reserve to the Austrians, after sending a strong corps toward the Danube, or the Austrians pour in a mass upon the Danube and risk a march to Constantinople. In either case, a separate army on the Danube, stronger than a demonstration corps, was superfluous. This is all the satisfaction he gave. Lord John Russell, in the Lower House, was forced by Mr. Disraeli to advance a step further, and plainly to confess that the boasted Treaty of Alliance means neither a treaty nor an alliance. He avows that it binds Austria to nothing at all, while it forces the Western Powers into an alliance offensive and defensive with Austria, if she should choose to declare war on Russia, and obliges them besides to propose to Russia, before the end of the year, conditions of peace on the basis of the famous four points[h]. After all, Austria might then, "without a breach of faith," release herself from the alliance by saying, "at the last moment," she did not concur in the interpretation put on the four points by the Western Powers. The result of Lord John Russell's explanation of the glorious treaty of December 2, was an immediate fall of the funds, both at London and at Paris. A year ago, the coalition pretended to have allowed the massacre of Sinope to take place in order to obtain the alliance of the German powers. Now, a sham treaty with one of these powers is held out as the equivalent for the loss not of a Turkish fleet, but of a British army. We are even assured by the latest German papers that the opening of the British Parliament has given the signal for the reappearance of the specter of the Vienna Conference, which was about once more to set its cumbrous machinery at work. However, as Austria, according to Lord John Russell, declares it possible that she may be driven to war with Russia, and as the position taken by the Russian army on the Austrian frontier indicates the same thing, we may suppose, for a moment, that Austria and the rest of Germany, even including Prussia, are to join the Western Powers. How far would Russia he prepared to meet such an eventuality? If in 1812 the Continental force launched against Russia was far weaker than that which she may perhaps see on her frontiers in April or May; if then England was her ally instead of her foe, Russia may console herself with the reflection that the more numerous the armies are which penetrate into her interior, the more chance is there of their speedy destruction, and that, on the other hand, she has now three times the troops under arms which she had then. Not that we think "Holy Russia" unassailable. On the contrary, Austria alone we consider fully her equal as to military resources, while Austria and Prussia united, are quite able, if merely military chances are taken into account, to force her to an ignominious peace. Any forty millions of men, concentrated upon a country of the size of Germany proper, will be able to cope successfully with the scattered sixty millions of Russian subjects. The strategy of an attack upon Russia from the west has been clearly enough defined by Napoleon, and had he not been forced by circumstances of a non-strategic nature to deviate from his plan, Russia's supremacy and integrity were seriously menaced in 1812. That plan was to advance to the Dvina and the Dnieper, to organize a defensive position, both as to fortifications, dépôts and communications, to take her fortresses on the Dvina, and to delay the march to Moscow, until the spring of 1813. He was induced to abandon this plan, late in the season, from political reasons, from the outcry of his officers against winter quarters in Lithuania, and from a blind faith in his invincibility. He marched to Moscow, and the result is known. The disaster was immensely aggravated by the maladministration of the French Commissariat, and by the want of warm clothing for the soldiers. Had these things been better attended to, Napoleon, on his retreat, might have found himself at Wilna at the head of an army twice in numbers that which Russia could oppose to him. His errors are before us; they are none of them of a nature irremediable: the fact of his penetrating to Moscow, the march of Charles XII to Poltava, prove that the country is accessible, though difficult of access; and as to maintaining a victorious army in its heart, that all depends upon the length of the line of operations, on the distance and the security of the bases. Napoleon's line of operations from the Rhine to Aylau and Friedland, if we consider long lines of operations in their capacity of drawbacks upon the active force of an army, will be about equal to a line of operations from Brest Litovski (supposing the Polish fortresses to be taken in the first year) to Moscow. And in this supposition no account is taken of the circumstance that the immediate base of operations would have been advanced to Vitebsk, Mogilev and Smolensk, without which preparatory act a march on Moscow would certainly be hazardous. Russia is certainly thinly populated; but we must not forget that the central provinces the very heart of Russian nationality and strength—have a population equal to that of central Europe. In Poland—that is, the five governments constituting the Russian kingdom of Poland— the average is about the same. The most populous districts of Russia—Moscow, Tula, Riasan, Nijni-Novgorod, Kaluga, Yaroslaf, Smolensk, &c.—are the very heart of Great Russia, and form a compact body; they are continued, in the south, by the equally populous Little Russian Provinces of Kiev, Poltava, Chernigov, Voronezh, &c. There are, in all, 29 Provinces or Governments, in which the population is quite half as dense as that of Germany. It is only the eastern and northern Provinces, and the steppes of the south, where population is very thin; partly also the formerly Polish Provinces of the west—Minsk, Mogilev and Grodno—on account of extensive swamps between the (Polish) Bug and Dniester. But an advancing army, having in its rear the corn-producing plains of Poland, Volhynia and Podolia, and in front, and for its theater of operations, those of Central Russia, need not be afraid of its subsistence, if it manages the matter anything like well, and if it learns from the Russians themselves how to employ the means of transport of the country. As for a devastation of all resources by the retreating army, as in 1812, such a thing is only possible on one line of operations, and in its immediate vicinity; and if Napoleon had not, by his hurried advance from Smolensk, tied himself down to a very short time in which to complete his campaign, he would have found plenty of resources around him. But being in a hurry, he could not forage out the country at a short distance from his line of march, and his foraging parties, at that time, appear actually to have been afraid of penetrating far into the immense pine forests which separate village from village. An army which can detach strong cavalry parties to hunt up provisions, and the numerous carts and wagons of the country, can easily provide itself with everything necessary in the shape of food; and it is not likely that Moscow will burn down a second time. But even in that case, a retreat to Smolensk cannot be prevented, and there the army would find its well-prepared base of operation provided with every necessary. But not only military questions are to be decided. Such a war must be brought to a close by political action too. It is possible that the declaration of Germany against Russia would be the signal for the restoration of Poland by Russia herself. Nicholas would certainly not part with the Lithuanian and other West-Russian provinces; but the kingdom of Poland, Galicia, Posen, and perhaps West and East Prussia, would form a pretty good-sized kingdom. Whether such a revival of Poland would be durable, who can tell? One thing is certain: it would put an end to what is hollow in the enthusiasm for Poland, which, for the last forty years, has been affected by everybody and anybody calling himself liberal or progressive. A Russian appeal to Hungary would be sure to follow; and, if the Magyars should demur, we must not forget that two-thirds of the population of Hungary consists of Slays, who consider the Magyars as a ruling and intruding aristocracy. On the other hand, Austria would, in such a case, not hesitate to restore the ancient Hungarian Constitution, thus aiming to blot Hungary out of the map of revolutionary Europe. This suffices to show what a wide perspective of military and political interest would be opened by the accession of Austria to the western alliance, and a chance of a war of all Europe against Russia. On the contrary supposition, the spring is likely to see a million and a half of soldiers arrayed against the Western Powers, and an Austro-Prussian army marching on the French frontiers. And then the management of the war is sure to be taken out of the hands of its present leaders. [a] An allusion to Napoleon I's words before the battle of Borodino: "This is the sun of Austerlitz."—Ed. [b] Le Moniteur universel, No. 346, December 12, 1854.—Ed. [c] Report from Bucharest of December 11, 1854. Le Moniteur universel, No. 347, December 13, 1854, reprinted in The Times, No. 21924, December 14, 1854.—Ed. [d] See this volume, pp. 498-504.—Ed. [e] See this volume, p. 542.—Ed. [f] Victoria R. Speech at the opening of Parliament on December 12, 1854. The Times, No. 21923, December 13, 1854.—Ed. [g] The Earl of Aberdeen's speech in the House of Lords on December 12, 1854. The Times, No. 21923, December 13, 1854.—Ed. [h] Lord John Russell's speech in the House of Commons on December 12, 1854. The Times, No. 21923, December 13, 1854.—Ed. This article was entered in the Notebook as "Freitag. 15. December. Strategisch-politische Betrachtungen über European War against Russia". The article was included by Eleanor Marx in The Eastern Question. December 2, 1854 was the third anniversary of Louis Bonaparte's coup d'état and the second anniversary of his proclamation as Emperor, and also the anniversary of Napoleon Bonaparte's proclamation as Emperor of the French (December 2, 1804) and the battle of Austerlitz (December 2, 1805). The words "which we receive by the Atlantic" were added by the Tribune editors. See notes 3↓, 106↓ and 158↓. The reference is to the protocol of the current Vienna conference signed on May 23, 1854.